With U.S. students underperforming in international tests, it may not be surprising that more than six-in-ten (64%) Americans say that parents do not put enough pressure on their children to do well in school; only 11% currently say parents put too much pressure on students, while 21% say parents are exerting the right amount of pressure. In sharp contrast, about two-thirds (68%) of the Chinese public take just the opposite position in saying that parents in their country, with its surging economy, put too much pressure on their children to succeed academically. The survey, conducted March 18 to May 15 by the Pew Research Center’s Global Attitudes Project, finds that Americans are considerably more likely than any other publics polled to say that parents do not put enough pressure on their children, while China is the only country in which a majority sees parents putting too much pressure on students. In nearly half of the countries surveyed, majorities or pluralities see parents applying too little pressure on students. In addition to the U.S., narrower majorities in Lithuania (55%) and Spain (52%) also think that parents in their countries are not pushing children hard enough to succeed in school, as do about half in Brazil (49%), the Palestinian territories (49%), and Israel (48%). While China is the only country where a majority offers the view that parents are applying too much pressure on their children, a 44%-plurality in India also sees parents putting too much pressure on children to succeed academically. Pluralities in Kenya (42%) and Pakistan (41%) also say students in their country face too much pressure from parents to do well in school. The percentage of Americans who say parents do not put enough pressure on their children to do well in school has increased by eight percentage points, from 56% in 2006. The shift has been especially notable among women, people between the ages 30 to 49, those with at least some college education, and Democrats. Five years ago, men were considerably more likely than women to say parents were not pushing their children hard enough; 62% of men said this was the case, compared with 51% of women. Today, however, men and women offer nearly identical views, with 65% of men and 62% of women saying parents put too little pressure on students. Similarly, the percentage of respondents between the ages 30 to 49 who say parents do not put enough pressure on children has increased by 13 percentage points since 2006. About seven-in-ten (72%) in this age group, which is more likely than any other group to have children younger than 18 living in their households, say parents are not tough enough; five years ago, 59% shared this view. 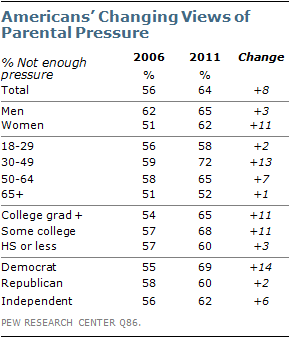 Opinions have been more stable among other age groups. Among college graduates and those with some college education, the percentage saying parents do not push their children hard enough has increased 11 percentage points since 2006, from 54% to 65% among those with a college degree and from 57% to 68% among those who attended but did not finish college. By comparison, views on this matter have not changed significantly among those with a high school education or less. Democrats are also far more likely than they were five years ago to say parents do not put enough pressure on their children to achieve academic success; 69% offer this view now, compared with a narrower 55%-majority in 2006. Views are largely unchanged among Republicans and independents.